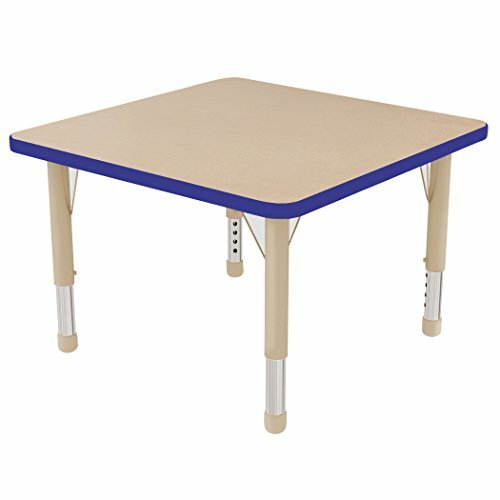 The ECR4Kids 30 inch x 60 inch square adjustable activity table is perfect for the classroom, playroom, home, or office. Table tops feature an easy to clean laminate with rounded edges for safety. A heat-sealed thermo-fused edge banding is applied to prevent against germ growth and provide an attractive professional look that will hold up against everyday use. Four types of adjustable table legs are available: toddler (15”-23”), chunky (15”– 24”), standard (19”-30”), and Super (19”-30”). upper table legs are powder coated tubular steel and lower legs are chrome plated, adjustable in 1” increments. Tables are available in a variety of attractive colors with your choice of glide.